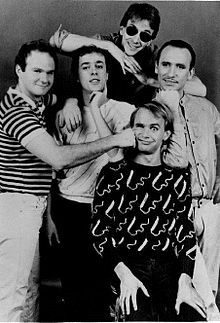 Men at Work war an Australian rock baund best kent for thair 1981 hit "Down Under". ↑ Erlewine, Stephen Thomas. "Men at Work – Artist Biography". AllMusic. All Media Network. Retrieved 24 April 2015. ↑ Hyden, Steven (19 April 2012). "Greg Ham of Men At Work, originator of the flute riff in "Down Under," found dead". The A.V. Club. Retrieved 24 April 2015. ↑ Tortorici, Frank (28 June 1999). "Men At Work's Colin Hay". MTV. Viacom. Retrieved 24 April 2015. ↑ Brandle, Lars (30 July 2009). "Men At Work Loses First Stage In Copyright Dispute". Retrieved 24 April 2015. ↑ Fletcher, Alex (30 July 2009). "Men At Work accused of plagiarism". Digital Spy. Hearst Magazines UK. Retrieved 2 July 2014. This page wis last eeditit on 8 November 2018, at 16:25.